Today one of our volunteers, Charlotte Knowles, tells us about her experience documenting our trade union badge collection. 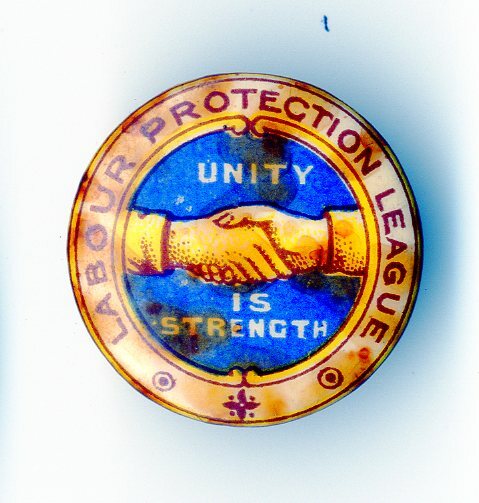 Transport and General Workers Union – this badge shows the clasped hands of unity. As a volunteer at the People’s History Museum I feel extremely privileged to have been given the opportunity to contribute to a project cataloguing the trade union badge collection. Every week I descend into the bowels of the museum to examine badges from all over the world and to help document the history of trade unionism. The experience has taught me much about trade unions, a subject of which I was completely ignorant before. The 18th and 19th centuries saw rapid industrialisation throughout Britain and consequently the foundation of many trade unions. The foundation of trade unions gave unprecedented security and protection for many workers and built a rostrum for the working-classes. It also created a sense of solidarity for union members, a community of allied workers who shared their concerns and would support one another. One of the most poignant relics of trade union history is the trade union badge. At the People’s History Museum we are currently cataloguing our impressive collection of trade union badges. We have recently counted them and discovered we possess 6,185 badges from all over the world! These badges are so important because each badge carries a wealth of information and symbolism. A badge not only identifies trade union members, but illustrates the pride workers take in their profession and in their union membership. They are adorned with images and mottos that communicate what the unions fight to protect. There are badges commemorating decades of membership, as well as important events such as conferences, strikes, elections and to honour the Tolpuddle martyrs. But perhaps most importantly, they proclaim the existence of the union and the power they can have to affect change. Whilst counting the thousands of badges in our collection many have stood out and fascinated me. 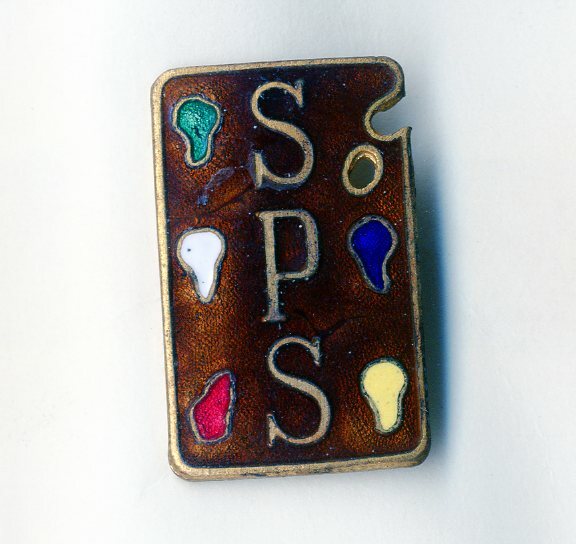 Some simply because they are unusual or interesting shapes, like the Scottish Painters Society badge – a beautiful enamel badge shaped like a painter’s palette. The Scottish Painters Society was founded in 1898 for 1,227 Scottish house and ship painters. 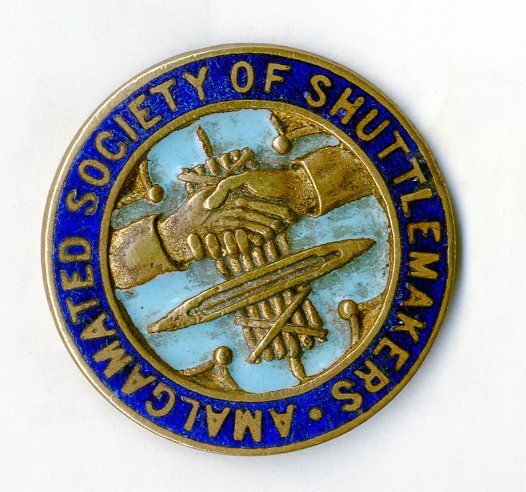 Others because of the eye-catching symbolism, such as the Amalgamated Society of Shuttlemakers badge. The union was founded in 1891 in Lancashire and Yorkshire. After World War II, 90% of shuttlemakers in the UK belonged to the union, but it was disbanded in 1993 with only 7 members remaining. Their badge brings together the clasped hands of unity, the ancient Roman symbol of power called the ‘fasces’ and the shuttle, the product of their industry. This powerfully symbolises what the union stood for – strength through unity and work. But the most interesting thing about our trade union badges is thinking about the people who wore them. It reminds us of the message of the People’s History Museum – that there are ideas worth fighting for. The people who wore those badges were members of a union because they banded together to fight for their own working rights, and those of others in their industry. This entry was posted in Badges, People's History Museum, PHM Collection, Placement Students, Research and tagged Badges, Museum Badges, People's History Museum, PHM Collection, Trade union, trade union badges, Trade Union Congress. Bookmark the permalink. ← Play Your Part Year 2 – Exciting times ahead!